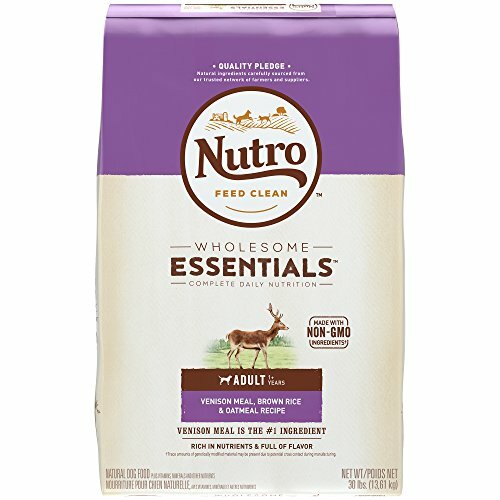 NUTRO WHOLESOME ESSENTIALS Adult Venison Meal, Brown Rice & Oatmeal Recipe Dog Food always starts with Venison Meal as the first ingredient. This natural adult dog food provides natural fiber for healthy digestion and essential antioxidants, such as Vitamin E, for a healthy immune system, plus vitamins, minerals and other nutrients. These recipes are also crafted to promote healthy skin and a soft, shiny coat. NUTRO Food for Dogs also follows the THE NUTRO FEED CLEAN philosophy, is always made with Non-GMO* Ingredients and is made with no artificial flavors, colors or preservatives. *Trace amounts of genetically modified material may be present due to potential cross contact during manufacturing. ! NATURAL CHOICE Sensitive Skin & Stomach Dry Dog Food Help minimize stomach sensitivity and improve your dog’s skin and coat by feeding them NATURAL CHOICE Sensitive Skin & Stomach Dry Dog Food. Some ingredients in natural† dog food can occasionally cause dogs to come down with skin allergies, digestive issues or dry, itchy skin. That’s why NATURAL CHOICE Sensitive Skin and Stomach does not contain corn or wheat, ingredients commonly tied to these issues. †with vitamins, minerals and other nutrients This dry dog food uses premium ingredients that are easy for dogs with sensitive stomachs to digest, and omega-6 fatty acid (linoleic acid) and zinc to help promote healthy skin and a shiny coat. Limited Ingredients for Your Dog’s Digestion in Our Sensitive Skin & Stomach Dry Dog Food Our natural dog food has a limited number of ingredients for optimal digestion. NATURAL CHOICE Sensitive Skin & Stomach Dry Dog Food also includes these other key benefits: • Made with either a single fish protein or New Zealand venison to minimize food sensitivities. • Vitamins, minerals and antioxidants that are vital for healthy metabolism • Guaranteed to improve skin & coat Available Varieties • NATURAL CHOICE Adult Sensitive Skin and Stomach Fish Meal, Whole Brown Rice & Potato Formula Dry Dog Food • NATURAL CHOICE Adult Sensitive Skin and Stomach Venison Meal & Whole Brown Rice Formula Dry Dog Food Available Sizes (varies by formula) • 5 lb. bag • 15 lb. bag • 30 lb. 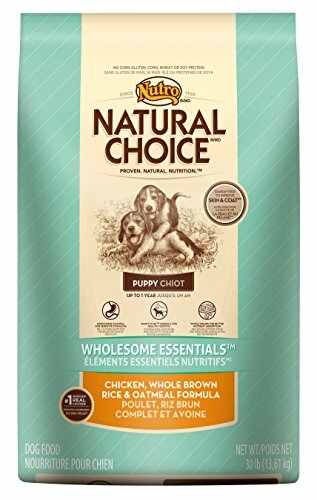 bag click to view product NATURAL CHOICE WHOLESOME ESSENTIALS Dry Dog Food NATURAL CHOICE WHOLESOME ESSENTIALS dog food holds the key to a balanced diet: a dry food with the #1 ingredient of great tasting, farm-raised chicken and oatmeal for sensitive stomachs. click to view product NATURAL CHOICE Canned Dog Food, Featuring Health Benefits Made with premium natural* ingredients, NATURAL CHOICE Canned Dog Food provides a delicious taste your dog will enjoy, and health benefits you can see. *with vitamins, minerals and other nutrients click to view product NATURAL CHOICE Limited Ingredient Diet Dry Dog Food Utilizing a select number of ingredients, NATURAL CHOICE Limited Ingredient Diet Dry Dog Food is made with real lamb and formulated with fewer ingredients to minimize food sensitivities. click to view product NUTRO Crunchy Treats These healthy treats contain no artificial colors, flavors or preservatives, so you can feel good rewarding your dog with delicious NUTRO Crunchy Treats. 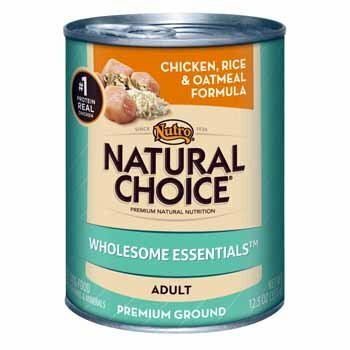 NATURAL CHOICE WHOLESOME ESSENTIALS Canned Dog Food As a pet parent, you won’t need to worry about what you’re feeding your pets with NATURAL CHOICE WHOLESOME ESSENTIALS Canned Dog Food. The #1 protein in each can is real chicken to help build muscle and maintain a healthy metabolism. Additionally, natural fibers nourish a healthy digestive system. A Natural* Wet Dog Food Featuring Real Farm-Raised Chicken NATURAL CHOICE WHOLESOME ESSENTIALS Canned Dog Food contains the necessary amino acids dogs need to build muscle and maintain a healthy metabolism. Optimal levels of linoleic acid and zinc in the natural dog food also help promote a healthy skin and coat. *with vitamins, minerals and other nutrients The natural dog food also includes these key benefits: • Oatmeal helps ease digestion for dogs with sensitive stomachs • Quality, natural ingredients with no artificial colors, flavors or preservatives • Healthy skin & coat Available Varieties • NATURAL CHOICE WHOLESOME ESSENTIALS Chicken, Rice & Oatmeal Formula Premium Ground Canned Puppy Food • NATURAL CHOICE WHOLESOME ESSENTIALS Chicken, Rice & Oatmeal Formula Premium Ground Canned Adult Dog Food • NATURAL CHOICE WHOLESOME ESSENTIALS Chicken, Rice & Oatmeal Formula Premium Ground Canned Senior Dog Food click to view product NATURAL CHOICE WHOLESOME ESSENTIALS Dry Dog Food NATURAL CHOICE WHOLESOME ESSENTIALS dog food holds the key to a balanced diet: a dry food with the #1 ingredient of great tasting, farm-raised chicken, and oatmeal for sensitive stomachs. click to view product NATURAL CHOICE Canned Dog Food, Featuring Health Benefits Made with premium natural* ingredients, including real proteins, NATURAL CHOICE Canned Dog Food provides delicious taste your dog will enjoy and health benefits you can see. 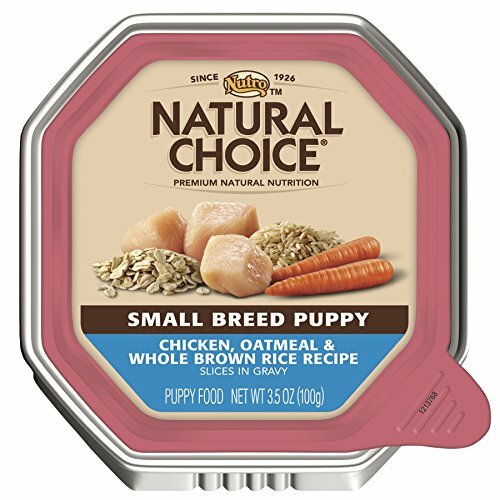 click to view product NATURAL CHOICE Large Breed Canned Dog Food NATURAL CHOICE Large Breed Canned Dog Food offers a delicious meal made from premium, natural* ingredients specifically tailored to your large breed dog’s nutritional needs. 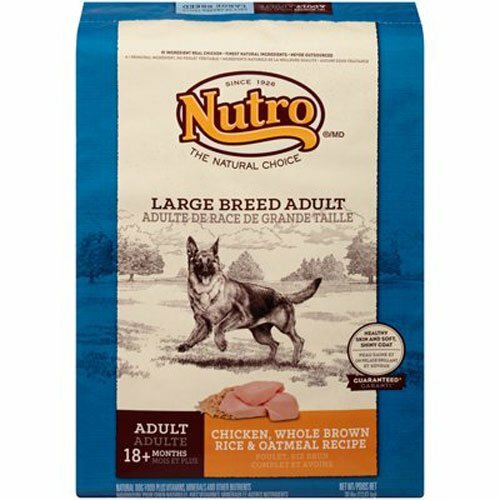 *with vitamins, minerals and other nutrients click to view product NUTRO Crunchy Treats These healthy treats contain no artificial colors, flavors or preservatives, so you can feel good rewarding your dog with delicious NUTRO Crunchy Treats. 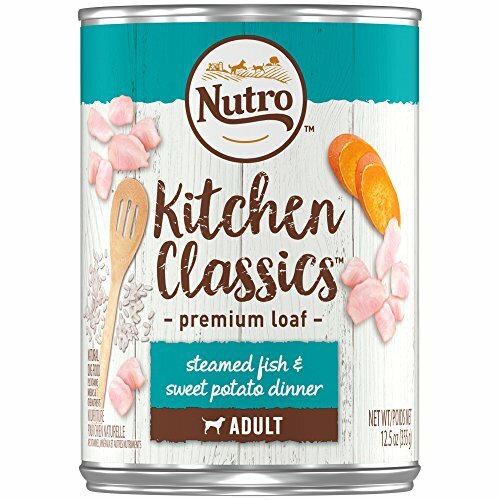 NUTRO KITCHEN CLASSICS Steamed Fish & Sweet Potato Dinner Premium Loaf is a tasty recipe crafted for Healthy Skin & Coat and helps support healthy digestion. This natural dog food offers complete nutrition, rich in nutrients and full of flavor. NUTRO Quality Pledge: Natural ingredients carefully sourced from our trusted network of farmers and suppliers, no chicken by-product meal, soy, artificial flavors or preservatives. NATURAL CHOICE Dog Biscuits with Health Benefits NATURAL CHOICE All Natural Dog Biscuits are the perfect treat for dogs that may have specific health needs. Whether you need a grain-free dog treat or a biscuit to help your pet’s sensitive stomach and skin, you can find the right NATURAL CHOICE product. Made with 100% natural* ingredients and real protein, your dog will love the taste and you’ll love the added health benefits. Spoil your dog with quality, natural ingredients and help support their health with these healthy dog treats. *with vitamins, minerals and other nutrients Healthy Dog Treats with Ingredients You Can Trust Whether your dog prefers the taste of lamb or chicken, our NATURAL CHOICE Dog Biscuits will be a tasty treat. Premium, natural* ingredients such as real chicken or lamb help support lean muscles and healthy mobility for your dog Available Varieties • NATURAL CHOICE Skin & Coat Adult Dog Biscuits Healthy Skin & Coat Recipe • NATURAL CHOICE Grain Free Adult Dog Biscuits Lamb & Potato Recipe • NATURAL CHOICE Tartar Control Adult Dog Biscuits Chicken & Whole Brown Rice Recipe • NATURAL CHOICE Sensitive Stomach Adult Dog Biscuits Chicken & Whole Brown Rice Recipe Available Sizes (varies by recipe) • 8-oz bag • 16-oz bag • 32-oz bag click to view product NATURAL CHOICE WHOLESOME ESSENTIALS Dry Dog Food NATURAL CHOICE WHOLESOME ESSENTIALS dog food holds the key to a balanced diet: a dry food with the #1 ingredient of great tasting, farm-raised chicken and oatmeal for sensitive stomachs. 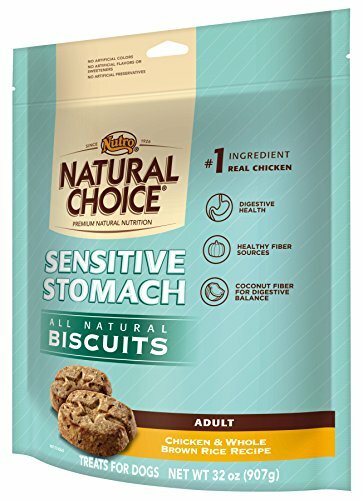 click to view product NATURAL CHOICE Adult Dog Biscuits - Chicken NATURAL CHOICE Adult Chicken Dog Biscuits are made with real chicken to support lean muscle development and healthy mobility. Reward your dog with an all-natural treat they’ll love. click to view product NATURAL CHOICE Canned Dog Food, Featuring Health Benefits Made with premium natural* ingredients, including real proteins, NATURAL CHOICE Canned Dog Food provides a delicious taste your dog will enjoy, and health benefits you can see. 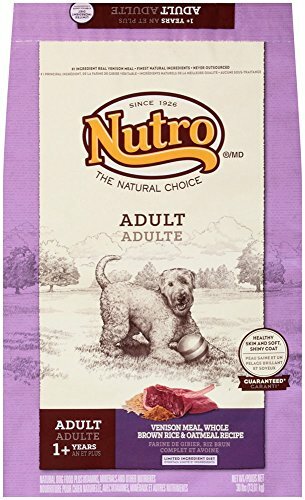 *with vitamins, minerals and other nutrients click to view product NUTRO Crunchy Treats These healthy treats contain no artificial colors, flavors or preservatives, so you can feel good rewarding your dog with delicious NUTRO Crunchy Treats. NATURAL CHOICE Canned Dog Food NATURAL CHOICE Canned Dog Food is made with premium, natural† ingredients and offers a complete, healthy meal with a taste your dog will enjoy. Our wet dog food formulas are made with optimal levels of omega-6 fatty acid (linoleic acid) and zinc to help promote a healthier skin and shinier coat. †with vitamins, minerals and other nutrients Real Protein is Number One for Our Natural Dog Food Whether it’s lamb or beef– real meat is our #1 protein in NATURAL CHOICE Wet Dog Food. Each canned dog food is produced in our own U.S. facilities and are never outsourced. NATURAL CHOICE Canned Dog Food formulas also include these key benefits: • Quality, natural† ingredients • Balanced protein & fat • A guaranteed healthy skin and soft, shiny coat Available Formulas • NATURAL CHOICE Adult Limited Ingredient Diet Lamb & Rice Formula Chunks in Gravy Senior Canned Dog Food • NATURAL CHOICE Puppy Development Lamb & Rice Formula Premium Ground Canned Puppy Food • NATURAL CHOICE Adult Beef & Potato Recipe Slices in Gravy Dog Food Trays • NATURAL CHOICE Beef & Vegetable Recipe Slices in Gravy Puppy Food Trays • NATURAL CHOICE Limited Ingredient Diet Lamb & Rice Formula Chunks in Gravy Canned Senior Dog Food Available Sizes • 3.5 Oz Trays • 12.5 Oz Can click to view product NATURAL CHOICE WHOLESOME ESSENTIALS Canned Dog Food NATURAL CHOICE WHOLESOME ESSENTIALS Canned Dog Food contains optimal levels of linoleic acid and zinc for a healthy skin and coat. These formulas also include the necessary amino acids dogs need to build muscle and maintain a healthy metabolism. 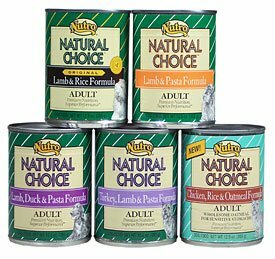 click to view product NATURAL CHOICE Limited Ingredient Diet Dry Dog Food Utilizing a select number of ingredients, NATURAL CHOICE Limited Ingredient Diet Dry Dog Food is made with real lamb and formulated with fewer ingredients to minimize food sensitivities. 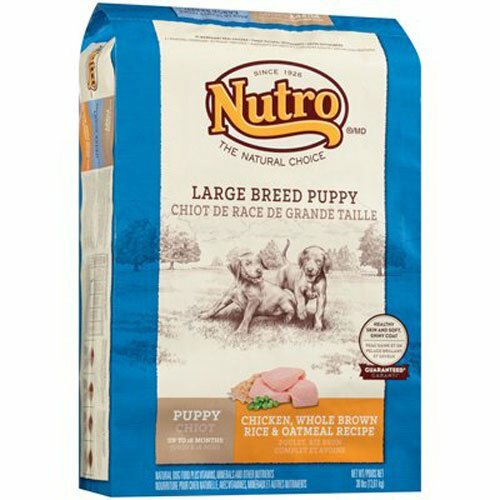 click to view product NATURAL CHOICE Large Breed Canned Dog Food NATURAL CHOICE Large Breed Canned Dog Food offers a delicious meal made from premium, natural* ingredients specifically tailored to your large breed dog’s nutritional needs. *with vitamins, minerals and other nutrients click to view product NATURAL CHOICE Dog Biscuits – Health Benefits NATURAL CHOICE Dog Biscuits come in a variety of special formulations which cater to dogs that may need treats that support specific health benefits. 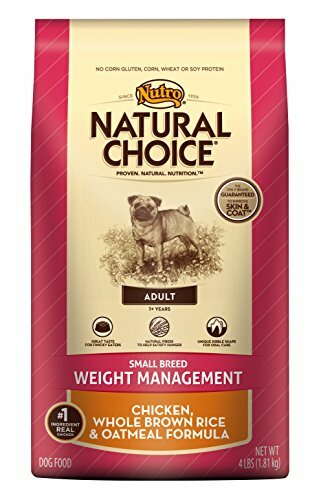 Nutro Natural Choice Small Breed Weight Management Chicken Dry Dog Food, 4 Lbs. NATURAL CHOICE Weight Management Dry Dog Food NATURAL CHOICE Weight Management Dry Dog Food is formulated to help your dog maintain a healthy weight and provide all the nutrients your dog needs in a natural* dog food, without any extra calories. By reducing feeding guidelines, NATURAL CHOICE Weight Management Dog Food provides optimal nutrition to help your dog support healthy weight loss. *with vitamins, minerals and other nutrients Feed Your Pet Our Natural Dog Food Made with Natural Ingredients Each bag of NATURAL CHOICE Weight Management Dog Food is made using farm-raised chicken from right here in the U.S. The chicken helps give your dog amino acids to build lean muscle and maintain a healthy metabolism. Our Weight Management Dry Dog Food also includes these key benefits: • Whole grains for better nutrient absorption • Glucosamine and chondroitin to help develop strong, healthy joints • A blend of high fiber & the right protein for healthy weight management • Guaranteed to improve skin & coat Available Varieties • NATURAL CHOICE Large Breed Adult Weight Management Chicken Meal, Whole Brown Rice & Oatmeal Formula Dry Dog Food • NATURAL CHOICE Small Breed Adult Weight Management Chicken, Whole Brown Rice & Oatmeal Formula Dry Dog Food Available Sizes Small Breed • 4-pound bag • 8-pound bag Large Breed • 15-pound bag • 30-pound bag click to view product NATURAL CHOICE WHOLESOME ESSENTIALS Dry Dog Food NATURAL CHOICE WHOLESOME ESSENTIALS dog food holds the key to a balanced diet: a dry food with the #1 ingredient of great tasting, farm-raised chicken, and oatmeal for sensitive stomachs. click to view product NATURAL CHOICE Dog Biscuits – Health Benefits NATURAL CHOICE Dog Biscuits come in a variety of special formulations which cater to dogs that may need treats that support specific health benefits. 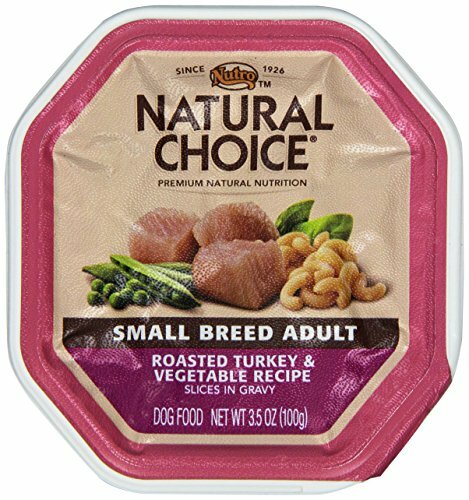 click to view product NATURAL CHOICE Large Breed Canned Dog Food NATURAL CHOICE Large Breed Canned Dog Food offers a delicious meal made from premium, natural* ingredients specifically tailored to your large breed dog’s nutritional needs. *with vitamins, minerals and other nutrients click to view product NATURAL CHOICE Dog Biscuits – Health Benefits NATURAL CHOICE Dog Biscuits come in a variety of special formulations which cater to dogs that may need treats that support specific health benefits. Help minimize stomach sensitivity and improve your dog's skin and coat. 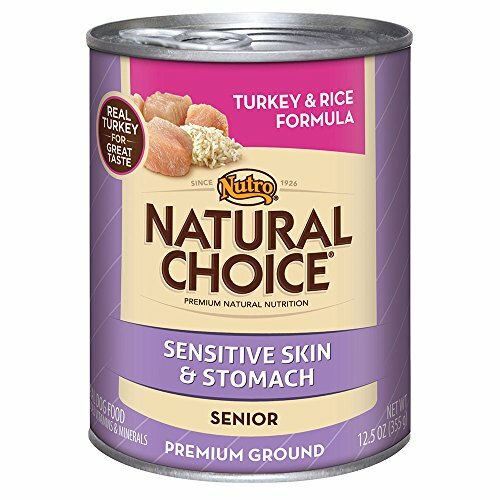 NATURAL CHOICE Sensitive Skin and Stomach Adult Formula is a natural adult dog food that's fortified with vitamins, minerals and other nutrients. It helps promote healthy digestion and has a great taste. Real New Zealand venison meal is a high-quality source of protein not typically found in dog food. Along with whole brown rice, these nutrient-dense ingredients are excellent sources of protein, fiber and vitamins to ensure premium nutrition and meals that are never boring. It's a real difference you'll notice, guaranteed. Wholesome oatmeal for sensitive stomachs.Highly digestible rice for stamina and energy.Real chicken protein for muscle development.Natural ingredients with vitamins and minerals.Guaranteed to improve skin and coat.Helps support a healthy immune system.Steam-cooked in broth for a taste dogs prefer. NATURAL CHOICE High Protein-Grain Free Dry Dog Food Give your dog the very best in natural nutrition. NATURAL CHOICE High Protein-Grain Free Dry Dog Food is formulated for active dogs, containing proteins and healthy carbohydrates for premium nutrition they will love. As a low glycemic recipe containing carbohydrates like chickpeas and split peas, this formula will help keep their energy levels steady all day long. Please Your Pet with Our Natural Dog Food In every bag of NATURAL CHOICE High Protein-Grain Free Dry Dog Food, real protein is the first ingredient, whether it’s our salmon, venison meal, chicken or duck recipe. In addition, each grain-free dog food provides several health benefits pet parents will love. These benefits include: • Grain free to avoid aggravating food sensitivities • A low glycemic recipe • Produced in our own U.S. facilities Available Varieties • NATURAL CHOICE Adult Chicken & Chickpeas High Protein-Grain Free Recipe Dry Dog Food • NATURAL CHOICE Adult Duck & Chickpeas High Protein-Grain Free Recipe Dry Dog Food • NATURAL CHOICE Adult Salmon & Chickpeas High Protein-Grain Free Recipe Dry Dog Food • NATURAL CHOICE Adult Venison Meal & Chickpeas High Protein-Grain Free Recipe Dry Dog Food Available Sizes • 4-pound bag • 24-pound bag click to view product NATURAL CHOICE WHOLESOME ESSENTIALS Dry Dog Food NATURAL CHOICE WHOLESOME ESSENTIALS dog food holds the key to a balanced diet: a dry food with the #1 ingredient of great tasting, farm-raised chicken and oatmeal for sensitive stomachs. click to view product NATURAL CHOICE Canned Dog Food, Featuring Health Benefits Made with premium natural* ingredients, NATURAL CHOICE Canned Dog Food provides a delicious taste your dog will enjoy, and health benefits you can see. *with vitamins, minerals and other nutrients click to view product NATURAL CHOICE Limited Ingredient Diet Dry Dog Food Utilizing a select number of ingredients, NATURAL CHOICE Limited Ingredient Diet Dry Dog Food is made with real lamb and formulated with fewer ingredients to minimize food sensitivities. click to view product NATURAL CHOICE Dog Biscuits – Health Benefits NATURAL CHOICE Dog Biscuits come in a variety of special formulations which cater to dogs that may need treats that support specific health benefits. 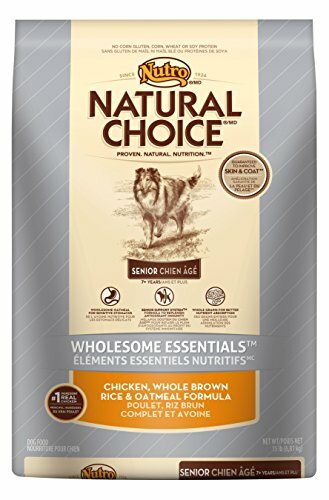 Natural Choice Senior Wholesome Essentials Chicken, Whole Brown Rice And Oatmeal Formula, 15 Lbs. 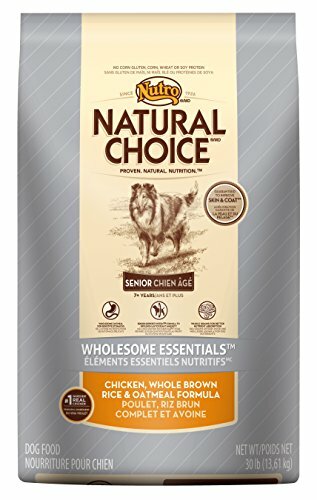 Nutro Natural Choice Chicken, Whole Brown Rice And Oatmeal Dry Puppy Food, 30 Lbs. 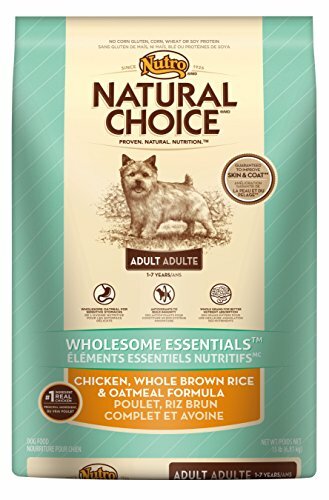 Natural Choice Adult Wholesome Essentials Chicken, Whole Brown Rice And Oatmeal Formula, 15 Lbs. 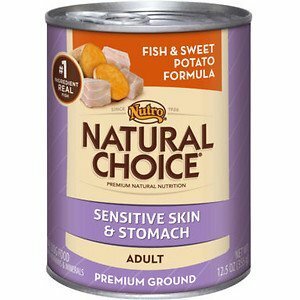 Nutro Natural Choice Sensitive Skin & Stomach Adult Fish & Sweet Potato Formula Canned Dog Food, 12.5-oz, case of 12; This natural dog food is perfect for pets with sensitive skin and sensitive stomachs. Natural Choice Sensitive Skin and Stomach Adult Fish & Sweet Potato Formula Premium Ground Dog Food provides complete, balanced nutrition for adult dogs that’s easy to digest. This wet formula features omega-rich fish, which supports brain function and heart health. And sweet potatoes are full of B vitamins, potassium and zinc. Key Benefits Specially formulated for adult dogs with sensitive skin and stomach Fish is a unique, high-quality source of protein that’s not often used in dog food, which makes it less likely to aggravate food sensitivities First ingredient is real, high-quality protein High-quality, natural ingredients in Natural Choice Pet Food to deliver balanced nutrition with proven visible health benefits Formula is fortified with vitamins, minerals and trace nutrients Omega-6 fatty acid and B vitamins combine to promote healthy skin and a soft, shiny coat no corn, no wheat, no soy Made in the USA! 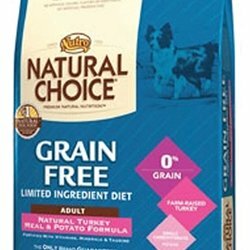 NATURAL CHOICE Grain Free Small Breed Adult Turkey Meal and Potato Formula Dog Food is a grain free, limited ingredient diet formula. It features natural, farm-raised turkey as the single, novel animal protein source and potatoes for a highly digestible carbohydrate source. Plus, NATURAL CHOICE Grain Free Dog Food is guaranteed** to improve skin and coat health.